Pearse Jordan was 23 when he was shot in the back in Belfast in November 1992. 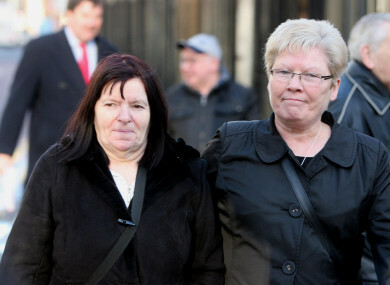 The mother of Pearse Jordan, Teresa Jordan (left) leaves a preliminary inquest into her son's shooting. THE UK’S SUPREME Court has allowed an appeal by Teresa Jordan, the mother of a man who was shot dead by the RUC in 1992. Pearse Jordan was aged 23 when he was shot in the back by a member of the Royal Ulster Constabulary on the Falls Road in Belfast in November 1992. An IRA volunteer, he was unarmed at the time of the shooting. Teresa Jordan is challenging a decision of the Court of Appeal that a bereaved next of kin can only bring a claim for damages arising from the State’s failure to hold an inquest promptly, after the inquest has been concluded. Jordan’s solicitor, Fearghal Shiels of Madden & Finucane, said that allowing the appeal had vindicated Teresa’s decision. It is a decision which is likely to have far reaching implications for dozens of next of kin in circumstances where the inquests into the deaths of their loved ones have effectively ground to a halt as a result of the woeful and deliberate failure to properly resource the coronial system. In 2001, the European Court of Human Rights condemned the UK for rights violations in connection with the killings of 14 people in Northern Ireland by British security forces between 1982 and 1992. This included the death of Pearse Jordan. Email “UK Supreme Court allows appeal from mother of man killed by RUC in 1992”. Feedback on “UK Supreme Court allows appeal from mother of man killed by RUC in 1992”.